The schools may have broken up for the summer, but here at the Tithe Barn we are already preparing for the new term! The Learning Service offers schools the opportunity to visit Abergavenny and take part in workshops exploring Tudor life. The workshops, run by volunteers who are mostly retired teachers, are based on active learning and are designed to support the National Curriculum. Typically schools select no more than three workshops and the children rotate throughout their visit. For a full day visit to Abergavenny, we are happy to recommend visits to Abergavenny Castle, Tretower Court or Raglan Castle to enhance and compliment the learning experience at the Tithe Barn. Learn about Tudor life and the clothes worn by rich and poor. Try on replica garments made using authentic style, fabrics and techniques. Find out what the rich and poor Tudors ate and their table manners (etiquette). Choose and sort foods and spices known to Tudors and discovered through global exploration. Visit the garden (weather permitting) and collect ingredients needed to create a simple dish. The children become ‘novice monks’ dressed in habits and sit in the Tudor choir stalls to meet ‘Brother Bartholemew’, the master of novice. He will tell the tale of the history of St Mary’s and its patrons, the Abergavenny nobility whose close ties to the Tudors ultimately saved St Mary’s from destruction by Henry VIII. Children encounter and play replica Tudor instruments, listen to a piece of Tudor music and learn to play the instruments in accompaniment. Find out about and have a go at making traditional herbal remedies in the finest Monastic traditions. This workshop includes harvesting herbs from the Abbot’s Garden (weather permitting). Handle replica objects relating to education and childhood growing up in Tudor times. Learn to play some typical Tudor games and sports, including Battledore (Tudor Badminton). Find out about Tudor cloth making and weave a section of braid or strap. Children will learn about clay modelling techniques and create items including coil pots and gruesome gargoyles based on the Victorian neo-Gothic gargoyles at St Mary’s Priory. Learn about the monumental eight metre wide Abergavenny Millennium Tapestry from one of its makers. Using the same techniques children can then have a go at tapestry embroidery. The last in this year’s series of food events celebrating local producers, chefs and restaurants in Monmouthshire took place in the Tithe Barn, Abergavenny, last night. Over the last few months the organisers of the Abergavenny Food Festival have offered food lovers the chance to watch local chefs in action at this year’s ‘Recipe for Success’ and given them the opportunity to meet local producers, sample products and purchase some of the wonderful local produce Monmouthshire has to offer. The masterclass and tutored tastings were compered by Mike Morgan, owner and manager of the Llansantffraed Court Hotel, who engaged with the chefs and audience, often with sense of humour. In such an intimate and friendly environment, the audience were able to interact with the chefs and ask questions about the produce or cooking techniques. The series kicked off in April with Steve Bennett, head chef of the Llansantffraed Court Hotel who cooked with beef from award-winning local butchers H J Edwards and Son. His recipe, Herb and Oxtail Glazed Fillet of Welsh Beef with Beer-cured Onions and Cauliflower Puree certainly impressed the audience and set the standard for the subsequent demonstrations. 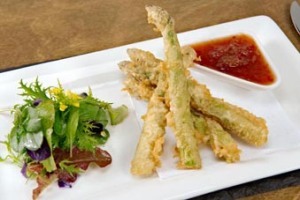 Simon King, head chef and co-proprietor of Restaurant 1861 followed this with Asparagus and Poached Egg Salad and Asparagus Tempura – two very seasonal dishes using local ingredients. In May, head chef of Peterstone Court, Iain Sampson (winner of the 2010 National Chef of Wales award) delighted the audience with new-season lamb. Unfortunately, the classic British summer weather did not allow for the demonstration to take place on a BBQ in the wonderful Tithe Barn Courtyard so it was back to the Tithe Barn kitchen for the remaining chef demonstrations! 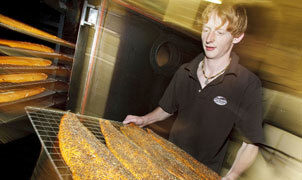 Hot on Iain’s heels was young chef, Wesley Harris, from The Charthouse. Wesley cooked quality traditional pork from locally bred, free range pigs at Usk Valley Saddlebacks. The audience was amazed at the taste of the different cuts of pork Wesley had to offer, including pigs trotters! This demonstration was Wesley’s first of many chef demonstrations in South Wales and he overcame his initial nerves when the blender he was using failed to work! The final chef demonstration saw the Crown at Pantygelli’s chef, Gary Nugent, cooking Baked Gurnard on Risotto ‘Tartare’ – an unusual but beautiful fish wrapped in Parma ham. The chef demonstration was filmed for the Abergavenny Food Festival website and is available to watch for free on YouTube. As well as local chefs, the ‘Recipe for Success’ also featured local producers who were able to talk to the audience about their produce and to promote their businesses. Producers included: Blaenafon Cheddar Company, Monmouthshire Honey, Ty Bryn Cider, Ty Mawr Organic Veg, Welsh Farmhouse Apple Juice, Wernddu Cider, Clams Cakes, Ancre Hill Estates, Usk River Chutneys, Black Mountain Smokery, Trealy Farm, Troggi Cider & Perry, Chepstow Cupcake Company, Avril’s Country Kitchen, The Burren Bread Co., Sarah’s Gifts and Hampers and Black Mountain Gold Chocolate. Congratulations to the chefs for the hard work and preparation and to the Abergavenny Food Festival for arranging such a wonderful, intimate, event and for promoting local producers and ingredients. Special thanks must be given to Freddy Edmunds who worked tirelessly behind the scenes liaising with the various participants, and also to Mike Morgan for his humour and knowledge of local cuisine. It was great to see so many members of the audience engaging with social media and ‘tweeting’ comments and photographs of the demonstration, using the hashtag #ChefDemo – even Steve Bennett managed to find some time to ‘tweet’ from the kitchen! We look forward to the Abergavenny Food Festival weekend in September and hope to see you all there! For more information and to purchase your tickets in advance, please visit the Abergavenny Food Festival website. Yesterday’s blog, Church and Social Media, generated a lot of interest. Many people have since asked me about QR codes which are now popping up in all sorts of places, including the Tithe Barn, Abergavenny. However, not many people know what a QR code is and do not know how Churches can use them to communicate effectively with their members or with tourists who may be visiting for the first time. A QR (Quick Response) code is a two-dimensional barcode, which has encoded in it a web address, text, telephone number, image or other information. The codes can be scanned with a smart phone and allow the user to access a wealth of information instantaneously without having to type in a web address; QR codes are already being used on product packaging, magazine article, advertisements, museum or art exhibitions and business cards. There are plenty of free applications to download for your smart phone which can scan QR codes. 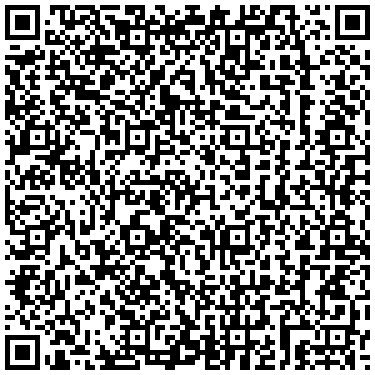 If you already have a smart phone, why not try scanning this QR code? How can a QR code be used in your Church? Use a QR code in your Church magazine or weekly bulletin to take the reader to additional information. Alternatively, put the entire Church magazine on your website and use a QR code in the Church to take people to that website. Use the QR code to take Church members to a podcast / videocast of your latest sermon or thought of the day. Use a QR code on the front gate or Church sign for visitors to find out more information – particularly useful if the Church is closed. I have a QR code (as well as a link to Twitter and Facebook) on the front door of the Tithe Barn to tell people what the building is and to welcome them – the code links to a separate blog with a welcome message. Use QR codes next to monuments or artefacts in the Church. The QR code can point to a website giving more information, including photographs or videos, about that particular item. Great for new visitors! Use a QR code on a Back to Church Sunday invitation card to give more details about the service. Create personalised gifts, for example mugs or keyrings, with a QR code linking to the Church website to give to new visitors. Print a QR code on the back of a t-shirt and wear it next time you are wandering around town – I wonder how many people will be intrigued and scan it when you’re not looking?!? Perhaps the QR can point to a message explaining when the next service is. There are several free websites available and creating a QR code is simple; just enter the web address, telephone number or text message that you would like the code to point to… and the website will automatically create the code for you! I use www.qrstuff.com to create my QR codes. If you have some great ideas on how QR codes can be used in Church, please let me know! Churches are using Social Media to help spread the Good News and reach a larger audience. Over the last couple of years there has been a fundamental shift in the way people use the internet. With the rapid growth of social media websites, such as Twitter and Facebook, people are now exploring new forms of communication which enables ordinary people to put their own views, opinions or ideas online and to interact with others. Whereas traditional websites, built by designers and maintained by experts, contain ‘static’ information which is often not updated regularly, social media results in a form of communication that is constantly changing; with these platforms, a whole variety of online conversations are taking place with a level of connectivity that would have been unthinkable thirty years ago. The nature of social media means that communication is open to all, even when the Church doors are shut! Social media has infiltrated almost every aspect of our public and personal lives. Facebook and Twitter logos appear on everything from your favourite breakfast cereal packet to hotel brochures, and people are constantly being encouraged to share photographs or videos on website such as Flickr and YouTube. All these developments mean that we as churches have to start thinking about how we respond to the presence of this new form of communication to engage with the community or to encourage visitors. The Church in Wales is urging clergy to use social media tools to help spread their message beyond the pulpit and has now produced a policy document for advice on the use of social media. Web based social media makes it possible to connect people who share interests and activities across political, economic, and geographic borders and therefore it is an ideal platform to communicate the Good News, advertise your next Church fundraising event or to engage in theological discussion with people you have never met! So, what can your Church do to engage in social media and help spread the Gospel? Start ‘Tweeting’Twitter (http://www.twitter.com/) has generated over 6 trillion tweets to date and is now the fastest growing form of social networking. Messages of up to 140 characters can be ‘tweeted’ to your followers, who may ‘re-tweet’ it to their followers… and so on! Why not start following @ChurchinWales or @TitheBarn for some ideas! Set up a Facebook page Facebook http://www.facebook.com/ is the most popular social networking website, with over 400 million users worldwide. Build a Church Facebook group and share what you are up to with your followers. Upload photographs on Flickr Use Flickr (http://www.flickr.com/) to share photographs of Church events with a private group (your parishioners). Tourists will often use Flickr as a search engine to find our what a place looks like before they visit, so add as many photographs of the Church as possible to share with the wider community. Upload videos on YouTube Why not consider uploading your sermon on YouTube (http://www.youtube.com/) so that your message can be heard all over the world. Parishioners can also watch your sermon in the comfort of their own home later in the week – there’s now no excuse! Create an e-mail signature to show people you are connected and to point them to your Facebook, Twitter or Flickr page. ‘Check-in’ using FourSquare With the GPS function on your mobile phone you can ‘check-in’ to a location using FourSquare (http://www.foursquare.com/) to let others know where you are and to share tips or photographs on that location. Visitors arriving in your town may search for local attractions and read comments to decide where they should visit – and your Church should be top of their list! Use QR codes QR (Quick Response) codes are bar codes which can be scanned by a mobile phone and take the user to a specific website or piece of text. Use them on posters to give more details about a specific event or service, or position them next to an object in the Church for visitors to find out more about it. To generate your own QR codes for free, visit http://www.qrstuff.com/ Click here to read my latest blog on QR codes. Add your Church to TripAdvisor It is estimated that 190 million people plan their holidays on TripAdvisor (http://www.tripadvisor.co.uk/) each week. When visitors are searching for your town or city, make sure that your Church is the main attraction for them to visit! Make your website ‘dynamic’ Include your live Twitter feeds on your Church website to make it dynamic and more appealing to visitors. 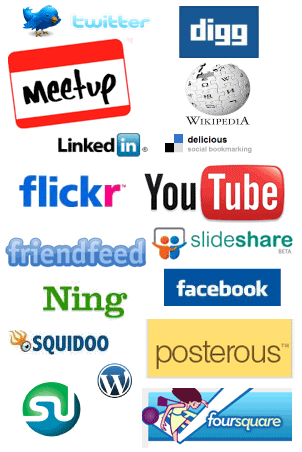 The more forms of social media your Church can engage in, the higher you will appear on search engines such as Google. It also means that the Gospel message is being spread to a much wider audience! The opening of the Tithe Barn has demonstrated, once again, the prominence of hospitality at the heart of the parochial life at St Mary’s Priory in Abergavenny. For very many years, now, we have been seeking to emphasise the Benedictine heritage of the parish dating back so very many centuries, though understandably somewhat interrupted by the shifting sands of history. But that Benedictine life was, and continues to be, much more than the daily round of a monastic community. 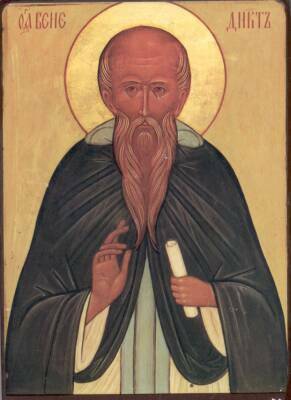 At the heart of that very rich tradition was the Rule of St Benedict, the father of Western Monasticism, and more latterly, acclaimed as the Patron Saint of Europe! That rule is very well worthwhile re-visiting for those who are seeking some more clear way of living out the Christian Life today. Like so many things it is all too easy to ‘dip’ into things, without discerning the depth and greatness which lies within. To that end we are pioneering what are effectively ‘Monastic Days’ – one a month, where we seek to focus the entirety of a day on that great Monastic Rule, attempting to focus our community life on worship, celebration, meditation and work. This includes the recitation and singing of the daily offices, the celebration of the Eucharist, time to eat together, a time of holy study, Lectio Divina, and an afternoon dedicated to physical work. In time, it is hoped that others will join this activity and come to share in something of the fullness of a praying and working community. Books exploring the Rule of Benedict and Lectio Divina are available from the Tithe Barn. A Jigsaw of a popular Abergavenny attraction sold out before it even hit the shelves. The 250-piece jigsaw shows part of the 24 feet long Abergavenny Tapestry, made by volunteers for the millenium celebrations, which depicts 1,000 years of the town’s history. The jigsaw is hand made by Wentworth Wooden Puzzles and some of the individual pieces are cut in the shape of icons of Wales. The jigsaws were so well received that a second order was made and has since hit the shelves. As well as the 250-piece jigsaw, the Tithe Barn now sells 40-piece jigsaws (£6.50) depicting specific parts of the tapestry, including the Red Kite, the Jesse (15th Century oak carving in St Mary’s Priory Church) and the Abergavenny Market Hall. These quality wooden jigsaws, made in Britain, make an ideal gift for both visitors and local people. The recording of history through the artistry of needlework is not new. The most famous worked example in Europe is the great Bayeux Tapestry, commission by Odo, half-brother of William the Conqueror, and exhibited for the first time in 1077 within the Cathedral Odo had built in Bayeux. It is a magnificent piece and it documents, amongst other things, the invasion by William, Duke of Normandy. All these centuries on, visitors to Bayeux continue to be thrilled by its extraordinary detail and lavish beauty. But whatever the artistry and the splendour of the tapestry it is the meticulous recording of the events that we find most exciting. The Abergavenny Tapestry may not be as long as its famous forebear, but its magnificence is no in question. It stands as a unique record of Abergavenny’s history and as a symbol of hope and beauty close to the Benedictine Priory Church which was itself built in the year King William died. The Abergavenny Tapestry tells the story, and as we stand before it the personality and character of each era speak to us, displayed, revealed and represented in such fine needlework and with enormous skill. There is something for everyone to ponder, to admire and from which to learn, in an environment that both welcomes and captivates. The Abergavenny Tapetsry is testimony not only to a wondrous history, not only to the skills of those who have worked it, but also to the spirit of companionship and co-operation that has seen both its conception and its fulfilment. The Abergavenny Tapestry is on display in the Tithe Barn, adjacent to St Mary’s Priory Church. The building is open 9.00am – 5.00pm Monday to Saturday. Entrance is free, although a donation is welcomed to help maintain this beautiful building. Souvenirs of the tapestry are available from the Tithe Barn Gift Shop – including the beautiful Wentworth Jigsaw puzzle.